They feel there are earthbound spirits or other “negative” energies in the home. The energy just feels stagnant or less than ideal. First things first, you want to clear the clutter from your home. Less is more when it comes to keeping your house clear of physical clutter as well as energetic clutter! If you have a lot of “stuff” everywhere, it stops energy from flowing as it should and it will also block the abundance in your life! It may seem unrelated, but it is true. Take a look at what objects you have in your home. If you collect antiques or other old objects, you will want to think about clearing the energy of each object as well. Whether you have antiques or just a lot of stuff, you have to keep in mind that everything has energy and gives off energy. Yes, even inanimate objects. I am very energetically sensitive, so I cannot walk into an antique store without getting woozy. And, even the grocery store is a difficult environment for people that are sensitive to energy because not only are there lots of people there, but lots of “things” too. Nine out of ten times when I am asked to “look into” the energy in someone’s home, the majority of the negativity is coming from the homeowners themselves. Here’s the thing, if you, or your family members, are spending a lot of time in negative vibrations, negative thinking, conflict, etc., you are setting the vibrational tone for the home. And, since the law of attraction is always at work, you will attract energies that match that lower vibration. These could be earthbound spirits, ghosts or other disincarnate entities. No bueno! I promise though, (unless you, or someone in your home, are a medium whose soul purpose is to help lost souls), if you keep a positive vibe in your home, you won’t be a match to these lower vibrational entities. (Note: don’t let the term “entity” freak you out. It is just another word for a collection of energy that doesn’t have a physical body). Another important distinction is that there are people, including and especially children, that are able to actually see into other dimensions. So, if you or your family member do “see” or sense someone or something that isn’t physical, it doesn’t always mean that the energy is “in” your home. Not to open up a whole can of worms here, but there are many non-physical dimensions that occupy the same “space” as us. It’s just that most of us cannot perceive them! Your mind is extremely powerful, and the two most powerful tools you have at your disposal are visualization and intention. We have been taught to think that these are “just thoughts” or imagination and that they are far less important than physical action. Oh how wrong that is my friend! Close your eyes and imagine a ball of bright white light sitting in the center of your home. As you visualize it, see it begin to grow and expand. As it expands, imagine the light turning into a tornado of light, spinning and growing as it begins to fill up each and every room in the home. As you imagine this light reaching every corner, every inch of your home, hold the intention that “Only love and light can exist in this home. I clear away any energy that is not in alignment with pure positive love.” You can end this process when you “feel” it is complete. Once you have done this clearing, imagine/visualize that at each doorway into your home, there is a curtain of white light that covers the entry. Set the intention that each time anyone enters your home, they must walk through this white light. This white light will clear their energy before entering your home. Another intention you can add in if you’d like is that anyone who does not have positive intentions toward you and your family may not enter the home. Just a warning, you may find that some of your friends and relatives will stop visiting, or won’t make it past your front porch! This is a space cleansing technique that many people are aware of already. Burning sage should raise the vibration of a space. You can sage your own energy field if you would like as well. Get a bundle of sage, or loose sage, and burn it. Walk around to each room spreading the smoke all around and in every corner. If you don’t like the smell of sage (it smells a lot like marijuana…or so I’ve been told…), you can buy sage sprays. The one I have smells heavenly. These are just a couple quick ways to clear the energy in your own home. 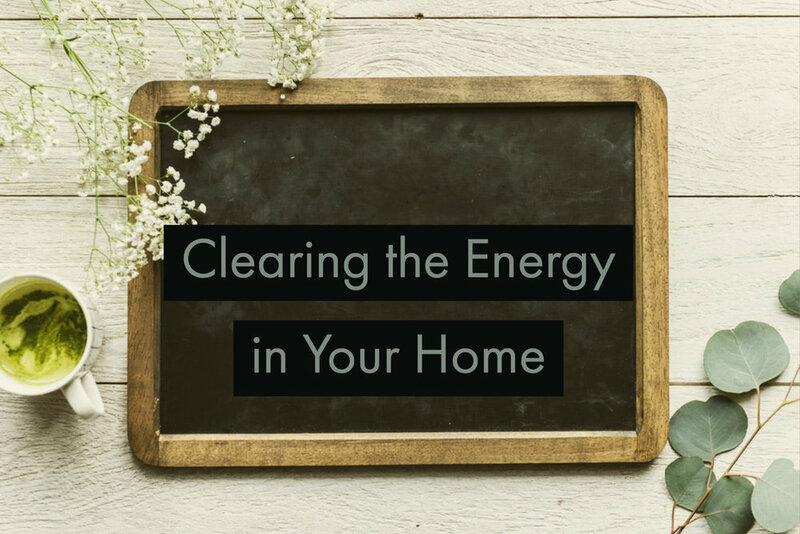 When I do a home clearing, I do it remotely by accessing the quantum field and the energetic Akashic record for the home and property. I can identify what is actually going on, what, if any, entities are present, if there are any portalways open, and other pertinent information. If there are any earthbound entities, I assist them in making their full transition back to the appropriate astral plane. Please, whatever you do, if you feel you need expert help with clearing any discarnate energies from your home or property, do not call paranormal investigators! Call a medium or psychic who knows how to help transmute the energies to the appropriate plane. We want to help these souls find their way back to alignment with Source energy. Jami Derro October 9, 2018 smudging, clearing energy, clear a house, sage a house.